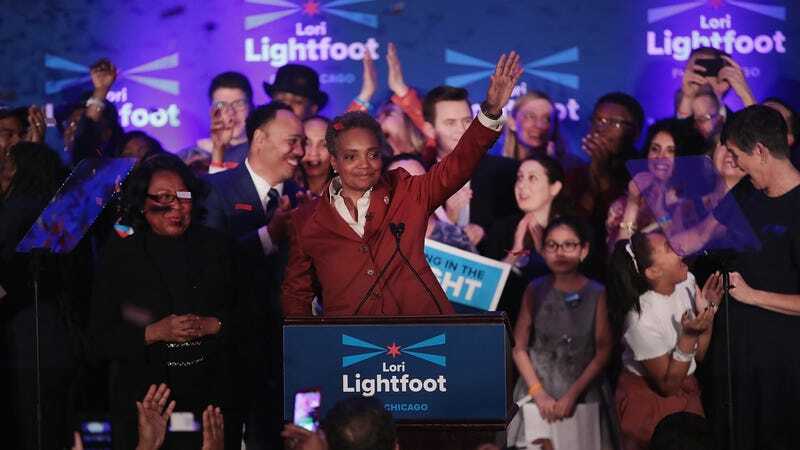 On Tuesday night, former federal prosecutor Lori Lightfoot was elected mayor of Chicago in a runoff election, winning handily over her opponent Toni Preckwinkle. As many journalists covering the election have noted, both the election itself and Lightfoot’s victory marked some important firsts: the first race in which it was guaranteed that a black woman would be the next leader of one of the nation’s largest cities, and with Lightfoot’s win, the first time an openly lesbian woman will be the city’s mayor. But what is also notable is the fact that many progressive activists and police reform organizers in Chicago have responded to her win—much as they responded to her campaign—primarily with concern about her record on law enforcement and accountability. This focus stands apart from from the press narrative around her identity as a black queer woman, and mirrors a dynamic that is also playing out in the presidential campaign of Kamala Harris in particular and, more broadly, a uniquely diverse Democratic primary field. We are in a moment in time when various organized movements—from Black Lives Matter to the call to end deportations and the campaign for Medicare for All—are making clear demands of our elected officials and those who run for office, and more people are doing the work to hold public officials accountable. In response, candidates and politicians are embracing increasingly progressive platforms, even if their records tell a more complicated story. In that way, the Chicago mayoral election is a window into some of these shifts. As we move closer to 2020, and as the Democratic Party continues to take a slow, uneven leftward turn, we will continue to see these kinds of tensions between progressive movements and the candidates working to court them. What happens next in Chicago, then, will be instructive. In 2002, Lightfoot was appointed the head of the Chicago Police Department’s Office of Professional Standards, a police oversight agency. In that role, she at times sided with top CPD officials, at least once despite the findings of OPS investigators. In one case, she declared an officer was justified in shooting and killing a 17-year-old, despite investigators concluding that the officer, Phyllis Clinkscales, had lied about what occurred; Clinkscales was given a 30-day suspension. During Lightfoot’s short tenure, according to one researcher, less than two percent of complaints made by Chicago residents against police officers were found credible, and few officers faced serious discipline. As a private attorney at the law firm Mayer Brown, Lightfoot also often sided with police officers and the department, defending the city in a high-profile police misconduct lawsuit in 2012 and representing the police department in a lawsuit brought by four men who were beaten by six off-duty police officers in 2006. More recently, in 2015, Lightfoot was appointed by then-mayor Rahm Emanuel to lead the Chicago Police Board, a disciplinary body with the power to fire police officers. That year, he also tapped Lightfoot to chair the city’s Police Accountability Task Force. Here, her track record on holding police accountable is similarly mixed, with local activists recalling instances where Lightfoot was dismissive of Chicago residents outraged over police killings. Lightfoot, though, defends her work, and also points to structural limitations on some of the reforms she wanted to enact. “There’s been nobody in the city that’s been a more vocal, persistent, demanding advocate for police reform and accountability than I have,” Lightfoot told the Chicago Tribune. And it’s true that she has demanded some reforms in her role as the chair of the task force, which in April 2016 released a scathing indictment of the CPD. Lightfoot has also not shied away from criticizing Emanuel for his many efforts to skirt accountability.